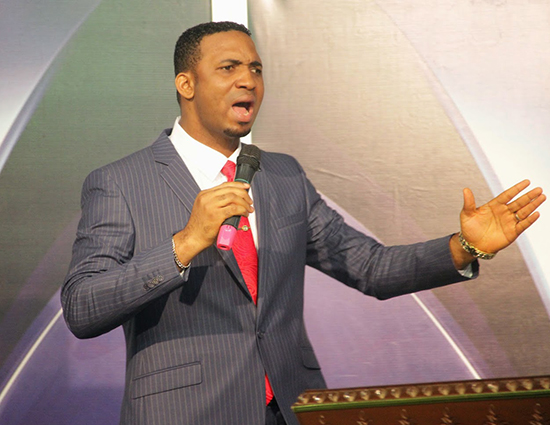 General Overseer of Mountain of Liberation and Miracle Ministry, Pastor Chris Okafor allegedly made a woman go blind after accusing her of being a witch. Pastor Okafor while conducting deliverance on a young lady identified as Blessing, called out Blessings' mom who was also at the service and claimed God ministered to him that she was behind her daughter's ordeal. The old woman identified as Dorcas denied she was responsible for her daughter's ailment and that didn't go down well with the pastor. Pastor Okafor said to her, "you say I'm lying", mama responded 'yes'. If it's God that spoke to me and you are the one and if I be a man of God, you'll be blind for 10 minutes. From this moment you will be blind for 10 minutes. If I be a man of God, go blind. Dorcas instantly went blind and struggled about for a while. He later prayed for her and her sight was restored.